While at the open market in Merida, Yucatan, I am struck by the sight of the local white eggs. They are extra large with thin shells, so thin that at the right time of day, when direct light hits them, you can see specks of yellow-orange from the interior yoke color. They easily reflect the colors of the surrounding area, some even appear to have a delicate pink cast with shadow shades of blue-gray. This changes with the time of day, which occurs to me that what I am looking at beyond light is time, time the qualifier of light. 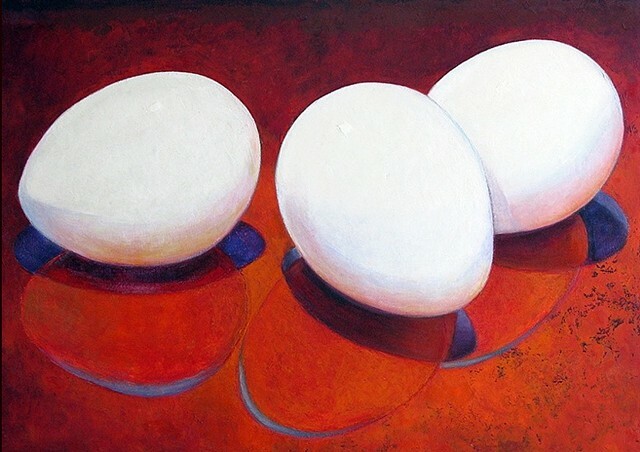 Positioning the eggs on various colored grounds, each painting becomes a search for tonal changes, the local light, high light, shade, cast shadow and reflected light. It is an exploration of the dynamic complexity of color, as a subject to paint they become a process of endless discovery. Everything about the egg conjures up meaning, yet who does not know what it is. I wanted to explore the idea of an image that is timeless, identifiable, with universal appeal. The egg is just that, a classic form, an icon of creativity and renewal, a modern model of "form follows function".